From weddings on the River Walk to romantic getaways to business trips-whatever your reason for visiting, we're here to make your San Antonio stay one you'll remember. We take pride in delivering an impeccable experience rather than a routine hotel stay. The architectural craftsmanship and opulent finishes throughout the design of our hotel envelop your senses while our luxury amenities cater to your every need. With world-class dining and in-room spa services, you may find it difficult to leave at all during your stay, but when you do a bevy of options are just steps away.Steeped in history and charm, Hotel Valencia Riverwalk marries tradition with contemporary ideals. Our San Antonio downtown hotel's location on the quiet part of the River Walk keeps you in the middle of the action without sacrificing tranquility. Luxury in the Heart of Scenic San Antonio Hill Country. 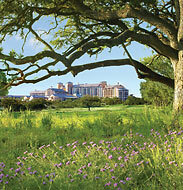 Situated atop one of the highest points in all of San Antonio you'll find La Cantera Hill Country Resort. It's a place where peace and tranquility flourish. Where emerald fairways and sparkling pools are the only things interrupting the scenic vistas overlooking the Texas Hill Country. A place where you'll find a new sense of relaxation, whether you're staying for business or for a well-deserved vacation. Welcome to La Cantera Resort. With 2 18-hole championship golf course on site, 5 pools and 9 restaurants, La Cantera is less than one mile away from Six Flags, world class shopping and dining at the shops of La Cantera and the Rim. 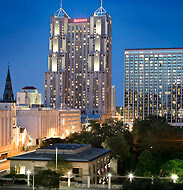 Only 15 minutes to Downtown San Antonio, The Alamo and The Riverwalk. Sleep your way to new Callaway� Golf equipment with Crowne Plaza. 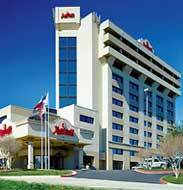 San Antonio Crowne Plaza Hotel-Riverwalk ***Located on the Riverwalk*** Enjoy all the excitement, charm and culture of San Antonio while staying at this beautiful AAA 4-diamond hotel. Experience the warmth and comfort of the grand hotel combined with the comfort and amenities of today's business hotels. Located near SBC, Frost Bank, Toyota, Boeing, General Electric and USAA, the hotel is within walking distance of the Alamo, Hemisfair Park and Tower, El Mercado Marketplace, the San Antonio Convention Center and the RiverCenter Mall. We are a short drive to Fiesta Texas, A Six Flags Amusement Park, Sea World, Schlitterbahn Water Park, the San Antonio Missions and the San Marcos Outlet Center. This 410-room hotel feature 37,000 sq ft of meeting space, with a grand ballroom and exhibit hall. All rooms are wired with High Speed Internet Access with Wi-FI (wireless) access in the public areas. We feature valet and self parking for all guests and meeting attendees. The hotel features a roof top pool, sauna, whirlpool and a complimentary full fitness center. Pet Friendly hotel please go to Hotel Features for additional information and fees. 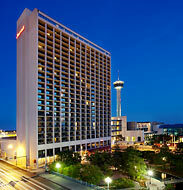 Choose upscale hotels in San Antonio from our selection of top exclusive 4 & 5 star luxury accomodations and hotels in San Antonio from luxurious hotel brands like Conrad Hotels, Morgans Hotel Group, Fairmont Hotels & Resorts, Inter-Continental Hotels, Crowne Plaza, DoubleTree Hotels & Resorts and more. Hotels de luxe 4 et 5 etoiles en San Antonio, 4 e 5 stelle lusso hotel San Antonio.